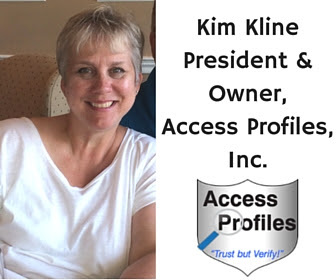 Access Profiles, Inc.: Question ~ Do Background Checks Really only Protect the Company? 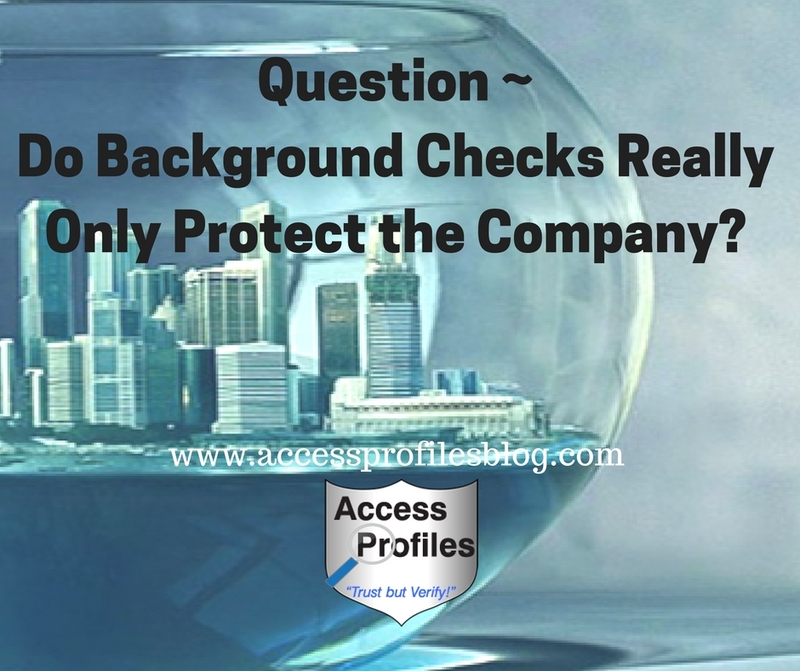 Question ~ Do Background Checks Really only Protect the Company? There are often questions when it comes to employment background checks. And many other questions that cause confusion and, sometimes, even fear. Recently, I received an email from Quora, the popular Q & A site. I was asked to answer a user’s questions concerning background checks. Is there harm to giving large bureaucracies more data about individuals? Does knowing you are being watched cause you to censor yourself? Does not hiring people with dicey backgrounds actually protect employers or customers? Do these checks allow employers to cover their asses more than protect anyone? I honestly found these questions to be very curious. They really got me thinking about an aspect of background checks I don’t normally question ~ is the company true purpose when it comes to background checks simply to protect themselves? That is why I have decided to share my answer. I hope to clear up some of the confusion about the true reasons employers do background checks, and why those reasons make perfect sense! "You definitely pose some interesting questions (user’s name removed)! I will say that I think when background checks are done with compliance to existing FCRA and EEOC regulations, they are good for all the parties involved ~ companies, new hires, and existing employees. Your first point, giving more personal information to large bureaucracies, is where I will start. Information about you is already “out there”. All criminal entities keep records of arrests, convictions, and dispositions / sentences. All employers keep records of past employees, including pay, job title, personnel and performance records, etc. And all education institutions keep records of diploma / degree earned and grades. Companies requesting this type of information for employment purposes are not digging into anything new. They are simply gathering information to show their due diligence in verifying a candidate’s resume and making sure there is nothing in their past that would make them an unfit or unsafe hire. Will being “watched” make you censor yourself? Not really sure what you mean here, except that, in this world, there is always someone watching ~ from parents when you are young, to teachers, and continuing on to employers and law enforcement (and it looks to me as if this certainly doesn’t curb the behavior of everyone!!). But as with anything, behaving appropriately for the situation is not a bad thing. You may act differently in your own home than you would at work, with friends, at a conference, or even in your church. Does hiring ex-offenders or those with “dicey” backgrounds really harm a company? In reality, there are many companies that do hire those with criminal pasts (I have clients that do just that). And I am a vocal proponent to giving people second chances. But, having all the information before an employer makes the hire is key. A person’s past can determine what type of job for which they may be eligible. For example, someone who has a past drug problem would not be a good hire as a personal care giver or in a hospital or pharmacy with access to drugs. A person who has embezzled may not be the best hire as a company bookkeeper. And someone with a violent past can be unsafe if dealing closely with your customers or your other employees. If a company does not do the screening necessary, they may be exposing not only their company to harm, but others as well. Your last question is the most interesting ~ are background checks done more to “cover their (the employer’s) asses” than to protect anyone? And my answer is, in part, you are exactly right! A company has every right to protect what they have built. If that means doing background checks to protect their reputation, company assets, and especially their employees and customers, then they have every right and obligation to do so. Companies that have forgone employment screening can find themselves on the losing end of expensive litigation. They are held responsible for the criminal behavior of their employees while on the job. This can’t be taken lightly. So, in my estimation, background checks do not cause more harm than good. Just the opposite, they protect all parties involved." I still found myself slightly taken aback. Companies are Right to Use Background Checks to Protect Themselves! "Tweet This"
In my estimation, the need to protect everything we have and worked hard for is entirely human. Any of us would be hard pressed to say we didn’t have the right to keep our spouse, family, friends, community, and country safe. We work hard and sacrifice much to build our businesses. Making them successful is something that takes the majority of our time and energy. Part of that success is predicated on building a skilled and safe workforce. Background checks are a viable and cost effective way to accomplish this. Through employment screening we can discover what we need to know to make the right hire. Verifying the information listed on an applicant’s resume makes sense. Employers need to be positive that it is truthful before making an offer of employment. In fact, resume lies can cost Small Business big money. There are definite costs that come with hiring, training, and replacing employees who, it may be found later, do not have the skills or education necessary to do the job. And if that is discovered, employers have to start the hiring process all over. Read more about this in “The High Cost of Resume Lies”. Despite there being strict laws that govern how we can use background check information, there is no law that prohibits us from screening our employees. And we have every right to do so. In fact, there are real and obvious dangers to skipping employment background checks, especially for small businesses. When you have a small company, the more “intimate setting” requires safer hires. In fact, your employees often have very close contact with your customers and with each other. It is your duty to protect them both. Knowing before you hire if your employee has a violent or abusive past is crucial to that duty. Businesses are often held legally responsible for the behavior and actions of their employees. Negligent hiring lawsuits can cripple a small business. Companies would have their heads in the sand if they didn’t do all they could to protect themselves from litigation. For anyone to suggest otherwise is ludicrous. And finally, for a business, reputation is everything. You want your company to be known for their honesty and integrity. Having unsafe employees can ruin that reputation. That is why using Background Checks before hiring anyone make perfect sense! Discover more about how Small Business and Background Checks make great partners here! Wouldn’t you want to do all you could to keep what is important to you safe? 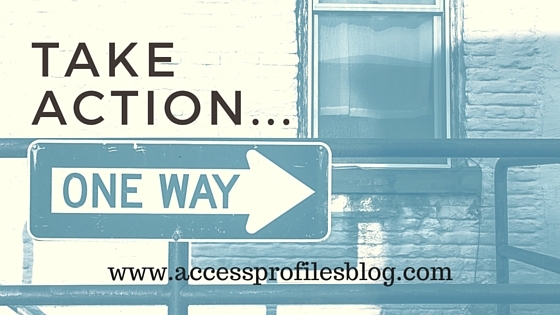 I can help you revamp your hiring policies and your business blog. Learn more About Me and My Services too!